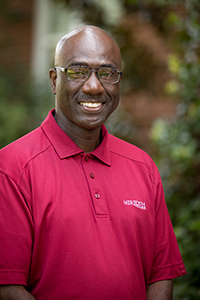 Chief Al White joined Meredith College in 2015 after 36 successful years of employment with the Raleigh Police Department and North Carolina Central University Police Department. In his role as chief of Meredith’s campus police department, he supervises a staff of 20, including three sworn officers and 17 security guards. During his time at Meredith, he has overseen a number of initiatives to improve safety and security on campus. These efforts include increasing the visibility of officers on campus, initiating bi-monthly in-service training for staff, and collaborating with Meredith Events to support campus events. White has been honored with many awards and accolades for his community service work in the Raleigh area. He is widely known for teaching security-related courses to Campus Police and Security Departments. He also serves on regional and statewide law enforcement boards. White is a graduate of the FBI National Academy and the Administrative Officers Management Program. He earned a master’s degree in public administration from North Carolina State University and a bachelor’s degree in criminal justice from North Carolina Central University.